did Ludwig ever make a 22 x 16 bassdrums in the sixties or early seventies? These are from 1959! They now belong to my good friend, Mike Layton. I have to admit though, that before I bought this kit, I had never seen a Ludwig bass drum this deep from the 50's. I see that this thread has been resurrected after more than 4 years! 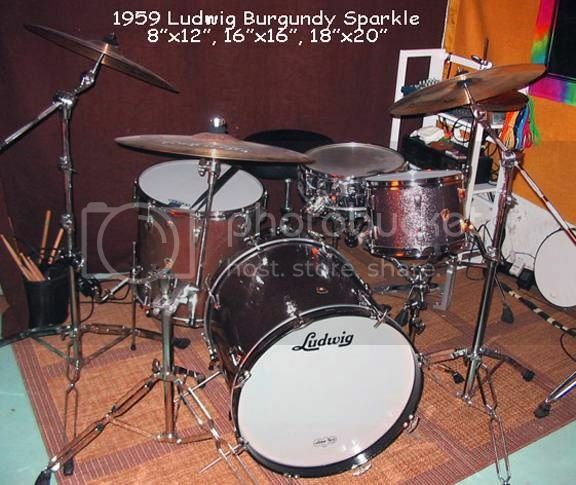 In regards to the 18x20 bass drum from 1959, Ludwig did offer an 18x20 floor tom, so it would be easy enough, on a custom order, to turn it into a bass drum. That burgundy sparkle kit is fantastic! We later figured out that the wrap is actually the same wrap that Gretsch used and called Starlight Sparkle instead of Burgundy. Most likely some type of special order. I now also have a 13" tom and a Super Classic snare with the same badge and wrap. And yes, the Wfl Compacto drum used a 18x20 shell as well. Mike! Can you post pictures? !